Do you know the Scottish word ‘dreek’? It means bad weather. In some areas of Scotland it means really bad weather – soaking wet and freezing cold. But with my Ayrshire chums it usually meant that horrible cold, wet weather where it wasn’t actually raining, but you were still getting wet anyway. The sort of day where there’s almost a mist, and there’s loads of moisture in the air and it’s sliding horribly round your warm layers and making you cold and miserable… but it’s not actually worth putting up your brolly because the water’s not actually falling. I hate dreek days. 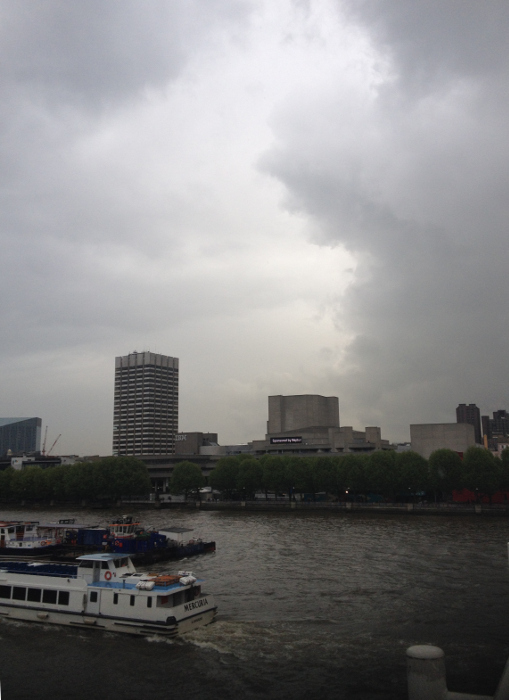 And dull, wet cloud like this picture of the Southbank in London. On a sunny day London transforms into one of the most beautiful places in Europe – gorgeous civic buildings, a long and fascinating history and the weather beaten populous blossom into smiling and generous souls. It usually lasts a day or two and then it’s back to cloudy. In September there is always a late and gorgeous flowering of beautiful weather for a few weeks. This takes the entire city by surprise: every freaking year. But soft and lovely as the ‘Indian summer’ is – it’s harsh in one way, as soon as it’s over, you’re into October and you’re straight into dreek. And dreek after sunshine is harder to bear. And it’s a big reason why I moved to India. I love blue shiny skies and not dragging myself through months of grey weather. Why do I mention this now? Because I’m working out where I’m going to live in the winter. I was going to return to India as you know, but the time difference from all my clients in the Eastern timezone is too brutal. I could go back to Europe – but it’ll be dreek. As you can see dreek is not appealing. So, not there. I’m thinking the Caribbean might be nice. Isn’t it fabulous being location independent? Signage Sunday : What if the hokey cokey is what it’s all about? Or check out all the signs on the complete Signage Sunday page.